Who knew that an abandoned slate mine in Wales could suddenly have jumped so many notches on our Must-See list? Bounce Below is the world’s first underground trampoline park, and families can have a unique bouncing adventure in this newly refurbished space, situated in the countryside of North Wales and located in the Llechwedd Slate Caverns. 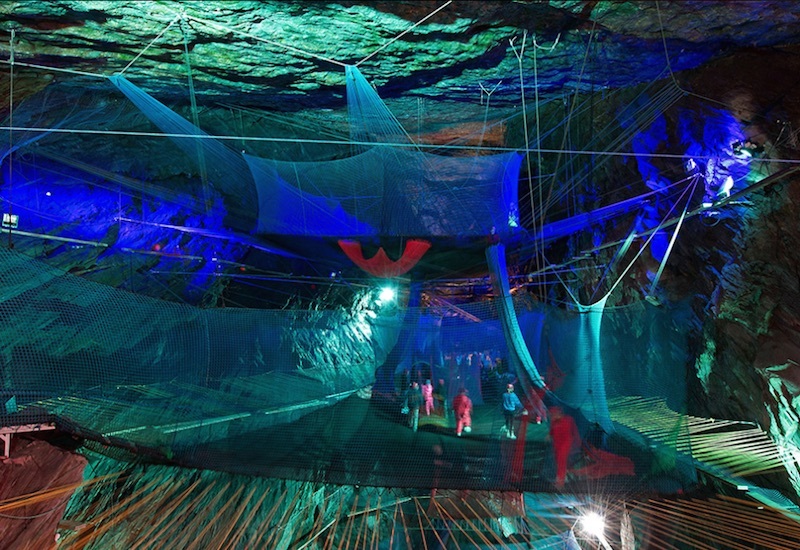 While it’s not for claustrophobic folks (or people who are concerned that all that bouncing may not be the best thing for centuries-old slate rock walls), thrill seekers can jump among any of the six huge trampolines that are staggered at different heights throughout the impressively sized space. Each of the trampolines can hold scores of people, so on a busy day, it would be like attending a giant underground trampoline rave (especially since the whole venue features neon lights aplenty). Or you could pretend like Batman decided to use his underground space to throw a giant get-together. In between the suspended trampolines are long sets of stairs, but Bounce Below has created a much more playful way to go from high to low: four new industrial slides which are each the height of two double decker buses. If bouncing and jumping in a subterranean lair isn’t exactly how you imagined spending your vacay to the Welsh countryside, you can get a completely different viewpoint by seeing the local sights from above on Europe’s first four person zipline. Bounce Below is open to kids ages seven and up although there’s also a nearby Junior Bounce option for kids ages three to six. Who knew that an abandoned slate mine in Wales could suddenly have jumped so many notches on our Must-See list? Bounce Below is the world's first underground trampoline park, and families�can have a unique bouncing adventure in this newly refurbished space, situated in the countryside of North Wales and located in the Llechwedd Slate Caverns. While it's not for claustrophobic folks (or people who are concerned that all that bouncing may not be the best thing for centuries-old slate rock walls), thrill seekers can jump among any of the six huge trampolines that are staggered at different heights throughout the impressively sized space. Each of the trampolines can hold scores of people, so on a busy day, it would be like attending a giant underground trampoline rave (especially since the whole venue features neon lights aplenty). Or you could pretend like Batman decided to use his underground space to throw a giant get-together. In between the suspended trampolines are long sets of stairs, but Bounce Below has created�a much more playful way to go from high to low: four new industrial slides which are each the height of two double decker buses. If bouncing and jumping in a subterranean lair isn't exactly how you imagined spending your vacay to the Welsh countryside, you can get�a completely different�viewpoint by seeing the local sights from above�on Europe's first four person zipline. Bounce Below is open to kids ages seven and up although there's also a nearby Junior Bounce option for kids ages three to six.